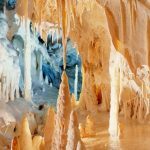 Wedged perfectly between the Adriatic and the Apennines, Marche is a true testament to its history. Practically every town here is equipped with castle, turret, and church all in reflection to the centuries of medieval battle that took place here. Sleepy and forgotten seaside resorts transport you as far back as the renaissance while the Palazzo Ducale in Urbino stands tall among the surrounding hills in historical defiance. Seaside Marche is a seafood haven. 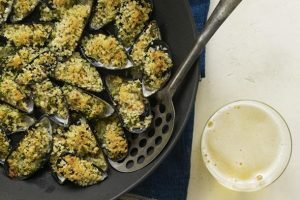 These mussels are stuffed with ham and parsley before fire roasting them in a tomato sauce. 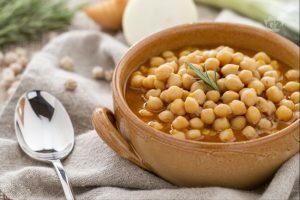 Chickpea and pork rib stew. It’s usually served with toasted bread that is piled high with pecorino cheese. 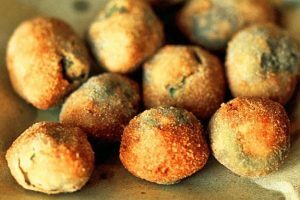 Olives stuffed with meat and deep fried. Great for aperitivo! The seaside town of Pesaro is a perfect one day destination in Marche. Head to the beach and bath in the Adriatic or explore the city’s rich history like the Palazzo Ducale. Opera lovers? The Rossini Opera Festival is held here annually. The harbour city and regional capital of Ancona is often overlooked by those who ferry in from Greece and other destinations. The hilltop views of the Adriatic are nothing short of stunning. The Conero Riviera is also popular destination spot for those who deserve some much needed relaxation. For a real taste of the renaissance take a tour of Urbino and its surrounding austere townships. Finally for a genuine immersion of Marche go on a food tour. 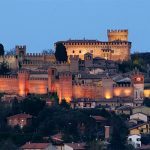 From Macerata to Caldarola there’s something for everyone. Wash it all down with a full glass of Rosso Piceno, made from regional Sangiovese grapes.